We are excited to attend the upcoming Tac Ops East 2017 Tactical Training Conference and Expo. This year’s Tac Ops East Conference will be held in Washington, DC from September 6th through September 8th. The Conference offers a full 3 days of training, tradeshows and networking, specifically built around SWAT teams. L-Tron is also excited to attend the Casino Night networking dinner Wednesday evening, September 6th. Be sure to stop by booth #319 to meet Elyse and Juli, and to chat about the Light Grenade. These sessions will highlight one of our tactical products – the Light Grenade. View the full Tac Ops East 2017 Conference agenda here. The Light Grenade is a 12-sided light source that is meant to protect officers and provide them with the tactical advantage. The Light Grenade was born when the inventor (a former Officer), was chasing a suspect in an abandoned building. He was moving down a dark hallway with a flashlight and realized that he was a moving target. He wanted a non-lethal light source he could throw down the hallway to illuminate his path and potentially the suspect, while keeping himself safe under the cover of darkness. The Light Grenade was made to protect Officers in similar situations. 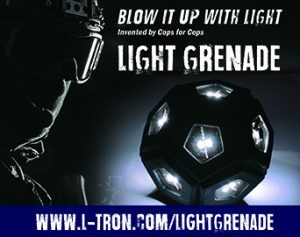 Like all L-Tron products, the Light Grenade is purpose-built from the voice of Law Enforcement. Contact L-Tron today to learn how you can get a T&E Light Grenade Unit. L-Tron will also be selling a limited supply of Light Grenades at the Tac Ops East 2017 Conference. Be sure to stop by booth 319 to learn more!